15km east of Qasr Harraneh lies Qusayr Amra, which in reality is not a castle, but a small bathhouse. Qusayr Amra has a more complex shape than Qasr Harraneh and has a number of cupolas and one external building. Qusayr Amra was probably built by the caliph Walid I between 711 and 715. 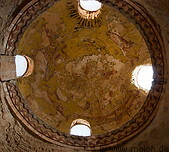 Inside the main building there are impressive frescoes, relatively well preserved. Quite astonishing to find this kind of art in such a place in the middle of nowhere. Some frescoes show medieval hunting scenes, others show fruits and vines, naked women and musicians. 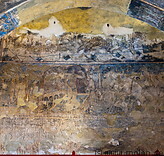 The frescos were created before the first Islamic edict ordering the destruction of images was issued. Qusayr Amra has been a UNESCO world heritage site since 1985.